I had the opportunity to meet the photographer Kenro Izu and attend his lecture on Sunday at the Detroit Institute of Arts (this photo won a contest related to his exhibition there). Izu takes photographs of "sacred places" around the world, mostly ruins. He uses a special large format camera he had made custom thirty years ago. The camera weighs 300 pounds and takes an hour to set up and Izu has dragged it to extremely remote mountan tops in Tibet and deserts in Western China (often using mules). He can only carry 80-120 unexposed sheets of film (14x20 inches in size) so he has to be very precise about what he photographs. He then returns to New York where he makes contact prints without enlargement and brushes on a coat of carbon pigment or platinum or palladium, much like Edward Steichen or Paul Strand might have done a century ago. It's a very anachronistic and expensive method to labor under in this digital age. But the finished photographs are beautiful. 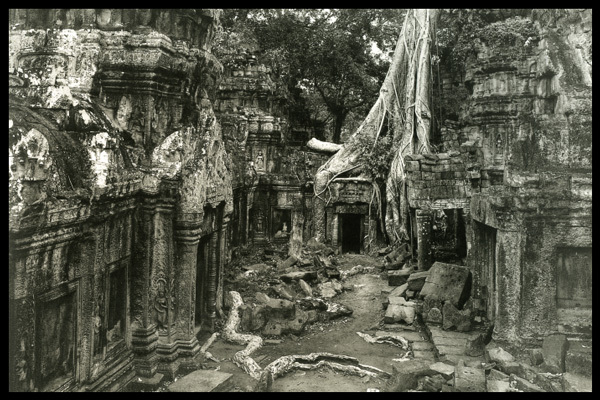 During the lecture, Izu showed a photograph he'd taken of a fading Hindu temple in Varanasi. He told the story of watching a nearby cremation, how for three hours the relatives of the deceased sat around laughing and poking the embers and turning the body until all that was left was ash and a hip bone that were then swept into the Ganges. In heavily-accented English Izu described with forgivable cliche how this made him consider the impermanence of the human condition, one second you're here and the next you're gone, dust to dust and all that. Then Izu started talking about the photograph itself, how busy the city had been and how he had to divert traffic behind him, around the site he was trying to photograph, and how some stragglers and a cow happened to walk their way across the exposing field of the camera's vision, though in the ten-minute exposure they never even appeared. For a few seconds they were there, but then in the developed photo they were nowhere to be seen, as though they had never even been there.